Welcome to another edition of Becoming A Modern Man! In this edition I will be looking at the Death & Taxes deck. The deck is a white weenie deck that runs various hatebears to make life difficult for your opponents. The list I'm using is largely based on this list that Linguica took to 4-0 in a recent Modern Daily. I've made a few minor adjustments for my deck, cutting Horizon Canopy as it ended up being over my budget (though the card seems to have dropped in price since I started writing this article). I also took the Tempest of Light out of the sideboard as the Aura Hexproof deck isn't as popular as it was a short while back, I added an extra Sunlance and an extra Kor Firewalker in their place. Judge's Familiar is a nice little creature. 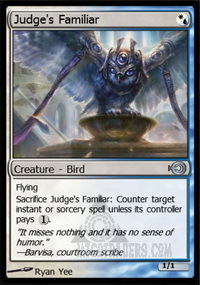 A 1/1 Flyer that can double up as Force Spike on instants or sorceries when necessary is pretty versatile for 1 mana. It works nicely with Thalia as you can really pressure their mana. It also works nicely with AEther Vial, if you have one counter on it, as you can flash in a surprise counter that they probably won't be expecting. Student of Warfare is a nice one drop if a little mana intensive. However, unanswered the Student can become a very serious threat and on occasion I've managed to make it into a 4/4 Doublestrike, which is pretty formidable. Thanks to AEther Vial you can have free mana to pump into your Student without missing the opportunity to drop a creature into play. Thalia is a classic example of a hatebear and a very powerful one at that. Taxing non-creature spells at 1 extra can make life very difficult for spell heavy decks, particularly combo decks. Thalia is also not someone you want to mess with on the battlefield, as a 2/1 first striker she can take down a considerably number of creatures from Goblin Guides to Dark Confidant. 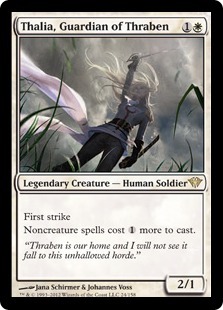 Thalia is a great 2 drop and one that buys you more time in the game, which also allows you to make your opponent's life even harder by adding more hatebears to the battlefield. One note to make though is that Thalia's effect works on you as well as your opponent, which is something to keep in mind when planning your plays. Leonin Arbiter can be devastating against the right deck. Tron players will have a very hard time with this guy out and Pod decks can be caused similar problems. Further even against decks that are less focused on searching, Leonin Arbiter puts a tax of 2 mana on the use of fetchlands, which can be devastating for the early development of a lot of decks. Arbiter also interacts really nicely with Ghost Quarter and Path to Exile. Provided your opponent doesn't have two mana open, a Ghost Quarter now says "Tap, Sacrifice Ghost Quarter: Destroy target land" and Path to Exile just says "Exile target creature". This can be very powerful especially when combined with other creatures like Thalia, which means that your opponent really needs their lands. 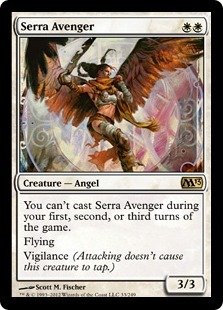 Avenger is a nice low mana cost threat and one that has great synergy with AEther Vial, which allows you to drop it onto the battlefield early and at instant speed. 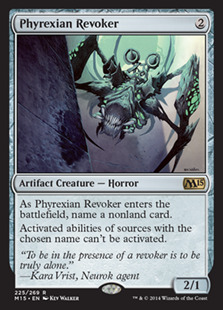 Phyrexian Revoker is a Pithing Needle on a stick. It works nicely as a way to shut down all sorts of things from Deathrite Shaman to Birthing Pod to Karn Liberated. 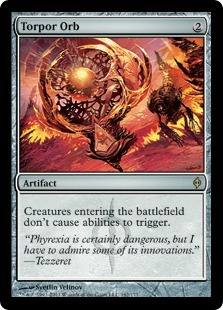 Phyrexian Revoker is a nice tool to help disable one or more of your opponent's threats while also keeping the aggression going. Mindcensor isn't a card I'm a massive fan of here. Against decks that don't care about it's ability its a 3 mana 2/1 flash creature with flying and that really isn't all that exciting. However, when it is good you're glad to have it. Kitchen Finks is just a high quality creature. It stymies the Burn and Aggro decks by providing you with life gain whilst also being a strong aggressive creature. 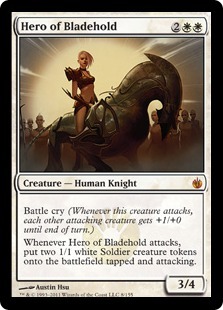 Hero of Bladehold is our best lone threat in the deck and it is definitely very powerful. If your opponent's side of the board isn't well developed then they will lose to Hero in pretty short order. A threat that requires a pretty immediate answer. Still one of the best removal spells in Modern. It's even better in this deck thanks to Leonin Arbiter and Aven Mindcensor working to negate the drawback of giving your opponent a land. That extra removal spell for when it's needed. Dismember is another very powerful removal spell capable of stopping most threats in the format. Vial is a great way to drop your creatures into play at instant speed. It also helps you in blowing up your opponent's lands as it allows to use your Ghost Quarters and Tectonic Edges without having to worry too much about having the mana to cast your creatures. 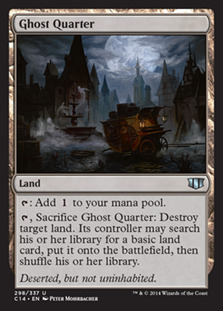 Ghost Quarter blows up your opponent's lands though they do get to pick a basic land out of their deck. This is very good against decks where the particular lands are important, such as Tron. However, in this deck Ghost Quarter has further utility thanks to Leonin Arbiter which prevents your opponent getting to search up a basic. This is a very powerful land destruction combination and one that your opponent's will probably curse you for. Tectonic Edge isn't quite as powerful as Ghost Quarter but acts as additional hate for non-basics. 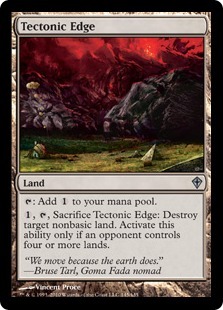 One thing to note is that you can sometimes trick your opponent into activating your Tectonic Edge by using Path to Exile when they have three lands out, they then search up a basic land and you can destroy the non-basic your want to get rid of. Disenchant is a simple but powerful card. 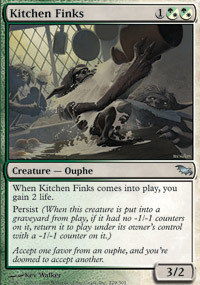 It is useful in a variety of different situations and is a solid sideboard card. 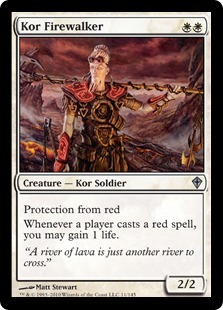 Kor Firewalker is amazing against red decks that often cannot cope once this guy hits the board. There are a variety of decks roaming around at the moment using a significant number of burn spells, not least the UWR decks, and Kor Firewalker is a great trump for those decks. Rest in Peace helps you to deal with graveyard shenanigans of all varieties. Stony Silence is a good tool against Tron decks, which are currently very popular, as it turns off their Chromatic Spheres, Expedition Maps and Oblivion Stones. It's also decent way of switching off Birthing Pod and other artifact based strategies. 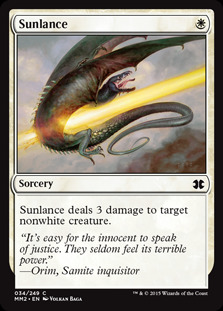 Sunlance is a nice removal spell that you don't see a ton of in Modern. More copies of Dismember could also go in this slot but Sunlance can often get the job done without suffering the life loss. Torpor Orb is a hoser for ETB effects. Great against Birthing Pod and Splinter Twin decks as well as various others. This deck is actually considerably more expensive that I realized when building it. I picked up a lot of these cards for the purpose of previous decks. A considerable number were needed for Soul Sister, Boros and other decks I've covered. AEther Vial and Thalia, Guardian of Thraben were the big cards I needed to acquire. I think a lot of the cards in this deck have uses in other decks which is nice, it's always good to have overlap. Our first matchup is against RDW. This is generally a very good matchup. Thalia slows them down and Kitchen Finks can give you enough life back that you can successfully race. After sideboard, Kor Firewalker comes in from the sideboard and makes things even better. I think I played 7 or 8 matches against various versions of RDW and only lost 1 thanks to a Leyline of Punishment. Overall, I'm pretty confident playing against RDW. Our second matchup is against RG Tron. This matchup should generally be favourable but this matchup shows that even then Tron is quite resilient and can combat through the hate. Game 1 our opponent managed to drop an early Karn Liberated and really things were kind of over from there. In Game 2, I had a lot of my hate cards and managed to keep my opponent in check for quite some time. However, my aggressive use of Tectonic Edges and Ghost Quarters led to me being in a situation where I only had 1 land and, failing to draw another land, was unable to capitalise on a strong position. Our third matchup is against Mono-Blue Tron. This matchup went more like I want my Tron matchups to go. In Game 1 I get an early concession after my opponent misses a land drop and my Leonin Arbiter shuts down his Expedition Map. In Game 2, I drop Stony Silence while my opponent has three copies of Talisman of Dominance. I then beat him down before he can find the blue mana he needs or Tron. I have to admit that my opponent did get a little unlucky in this matchup but the matchup does go to show the kind of damage you can do to Tron with this deck. Our fourth matchup is against Eggs/Second Breakfast. This matchup is pretty favourable as the deck has a lot of ways to interfere with their combo. Main deck Thalia is a real bane to the Eggs deck as when they are comboing off they need to keep a tight control on their mana. The fact that Second Sunrise will cost 4 and Faith's Reward will cost 5 is a real problem for them, equally it stymies their ability to put out a critical mass of Eggs as each with cost at least 2 mana to cast. Leonin Arbiter and Aven Mindcensor also pose a problem for the deck as it potentially shuts off their Reshapes and Ghost Quarters. Post-sideboard the matchup gets even better with Stony Silence and Rest in Peace being excellent trumps to their decks strategy. Stony Silence switches off all their artifacts and Rest in Peace means they can't use combo as their permanents don't go to the graveyard and thus Second Sunrise and Faith's Reward no longer work. Eggs has to find an answer to these enchantments or it will not be able to go off. I fully went into playing this deck believing I wouldn't enjoy it and initially I didn't. After all who enjoys taxes right! However, as I have played the deck more I've begun to like it more and more. The deck is actually quite well positioned in the metagame at the moment as Tron is one of the most popular decks and this deck has a reasonably good matchup against it (though perhaps not quite as favourable as I'd like). There a lot of nice interactions in the deck and it's just generally pretty enjoyable to play (if not so much to play against). However, I'm afraid that will have to be a deck for another time. That's all folks! My next article marks the 20th article in this series and so I'm planning something a bit different for that article. I hope you will enjoy it and until then you can catch up with the rest of the series by following this link. I'll never really understand the alchemy behind the archetype names in pro Magic. The original Death and Taxes was a rogue Legacy deck from a few years ago, whose creator became famous (to the point that WotC paid homage to his creation with a precon) for achieving great results with a relatively budget build. But it wasn't a hatebear deck, it was based on several tricks and interactions, the signature being Flickerwisp/Mangara/Karakas. There weren't hosers of any kind, the only card in common with this list is Aether Vial. Both can be considered White Weenie, I guess, but how TPTB decided that this was the Modern Death and Taxes beats me. I didn't know where the name came from, I assumed it was based on the hatebears. I have seen other versions of this deck that run the Managara/Flickerwisp/Stonecloaker combo and I guess this is another evolution of the deck. I did consider running the combo but it takes quite a lot of card commitment for an effect that isn't that amazing. If we had Karakas in Modern then things might be different. I apologies if I took the deck title out of context, though I'm still not quite sure how it relates to Mangara either. There have been some strange deck names and their origins are quite weird. According to LSV the Solar Flare deck is so called because of the eclipse in the back of the picture on Angel of Despair. The main point of many MTG deck names is to evoke something that is not necessarily adjacent to the concept of the deck. Hence the solar flare in Angel of Despair becomes the name for a deck involving reanimation. It is poetic and evocative. And does not really indicate what the deck does. Which is good when you want to reference a deck in conversation without tipping everyone off to exactly what you are talking about. No worries if you took license with it, though I did note the weirdness myself as that list isn't really related to D&T except for the predominance of white cards. I can't find the interview with the original creator of the deck (probably because I can't remember his name! ), but I recall they asked about the name, and he just loved the expression "Nothing is certain but death and taxes". No particular reference to the concept of "taxing" in MTG. 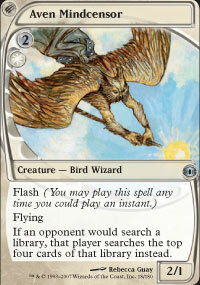 In fact, the archetype didn't run any "tax" effect until very recently, when Thalia joined its lineup. Isn't that what I confirmed? :) Adding the anecdotal edge, if sourceless. I believe the legacy deck ran generally ran Vials and Wastelands and Rishadan Ports, so it's not completely out of the question that it may at some point have ran Glowriders or other "tax" effects then in existence. 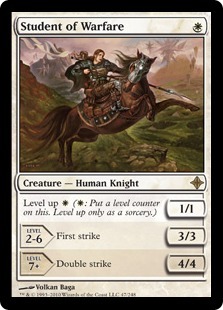 The generally accepted common elements of D&T were the presence of equipment beyond just a single miser's copy of Jitte (swords were not common pre-SFM), the Mangara/Flickerwisp tricks, and access to whatever disruption white/black had available. The hatebear angle, as well as the mana denial plan, really could be argued to be one of the defining attributes of the deck's *current* iteration, with the cute Mangara/Flickerwisp tricks falling out of favor anyhow. So I don't really think your use of the name is all that far off from the deck's original spirit. However, in crossing over to the Modern format, this kind of deck is most well known for having been played and tested by Brian Kibler on several occasions, and was always referred to by him as Hatebears, so I guess I go with Kibler in the end. Like I said above, it was never about "taxing". 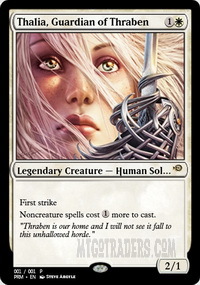 However, the deck runs Thalia now, because well, that's a no-brainer. It was always based on fast, efficient beaters, the original key creatures were Serra Avenger (that's still firmly there) and Jotun Grunt. And how is it a "failed attempt"? The original, if updated, WW form (the WG version, which probably then morphed into Maverick, Hatebear and co., was called "Green and Taxes") is still played as of right now, with great results. You could see it ending Top 4 in several SCG Opens last year, and as recently as October 2012 in Cincinnati. Top 4 in a Legacy with hundreds of participants is nothing to sneeze at, it probably did better than any Fish deck present. Wait, I believe there's been some confusion/misunderstanding here. 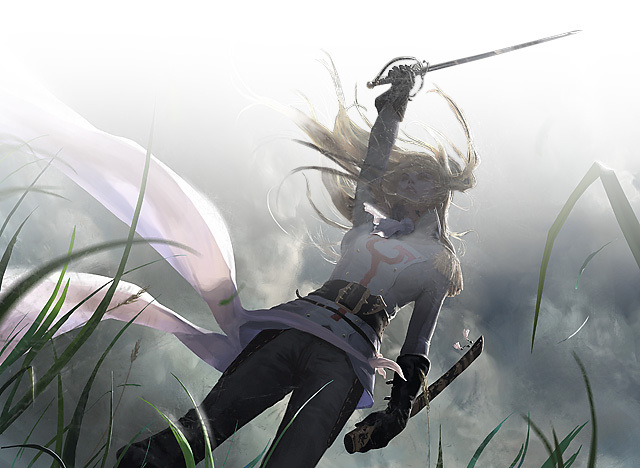 You're not the first to call this Modern deck "Death & Taxes" like the Legacy one. In fact, I never thought you were. You can find threads on MTG Salvation discussing the deck. Some of the lists are more similar to the original, but some are just like yours. I see now that another common ground is that the Modern version tries to work some mana denial via Tectonic Edge and Ghost Quarter, in place of Wasteland and Rishadan Port (which is kinda embarrassing, but that's what we have in Modern). When I was wondering why these names are inherited by decks that are almost entirely different from their "ancestor", I was talking in general, not about you. I understand. I know that I didn't invent the idea of calling the deck D&T. I was just apologising if the deck name had been taken out of context and/or it was confusing to anyone. I wasn't aware of its origins in Legacy or the fundamentals of that particular deck. You could well be right. I don't think there's a whole lot in it but Figure might be marginally better, particularly for dodging bolts and helix as you mentioned. That is an interesting post.In relation from it, H&R Block admitted to making an error in the filing of 600,000 returns seeking education tax credits. That delay could affect the federal financial aid of some of those taxpayers as well. A short term loan can help you pay for the things you need while waiting on a return.